Wheel chair users need to use Depot Street. 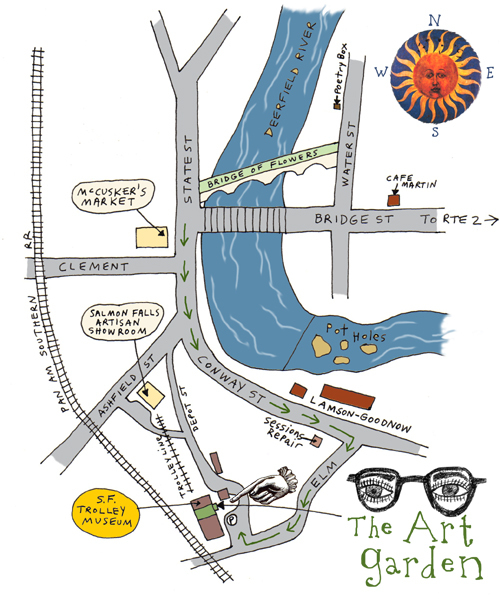 Walk or take the trolley [on summer weekends] from the Salmon Falls Artisan Showroom. All the best with this very cool, grand opening. It looks Great! We all our off to Florida so will not be joining you this weekend. I look forward to exploring “our” new studio when back! Wow. What a cool idea. Right now, I am trying to get it together with my community folks to start a community arts program which will include families with exceptional children. I am working to write grants, and find accessible places. Harder than I ever imagined. But, I am inspired by seeing what you are doing. I just hope I can “grow” some support soon. Diane form San Diego, Ca.